It all came crashing down for the No. 8 Florida Gators (1-1) on Monday as the Miami Hurricanes (2-0) exploded on a late 18-1 run and ultimately used 20 points scored by a single player in the final 6:47 of the contest to defeat their hosts 69-67 at the Stephen C. O’Connell Center in Gainesville, Florida. With the loss, the Gators ended their program-record 33-game home winning streak, which was the second-longest active streak in the nation and dated back to Nov. 11, 2012. Florida also lost its 25-game home winning streak against non-conference opponents that dated back to Dec. 22, 2010. It was over when: Florida and Miami were tied at 65 when redshirt junior guard Eli Carter rounded the foul line and drove to the rack, converting a layup to put the Gators ahead 67-65 with 1:03 to play. Hurricanes point guard Angel Rodriguez missed a three on the ensuing possession, but Miami got the ball back, called a timeout and set up for another shot. Rodriguez squared off with Florida sophomore PG Kasey Hill, crossed him over beyond the arc and drained a dagger three to push UM ahead with 18 seconds to play. Carter was called for an offensive charging foul (taken by Rodriguez) on UF’s next possession, Rodriguez made 1-of-2 foul shots after he was sent to the line, and an off-balance three shot by Gators junior G Michael Frazier II clanged off the rim at the buzzer. Significant stretch: Erasing a double-digit lead Florida held most of the game, Miami erupted on an 18-1 run late in the second half – courtesy of four-straight treys, including three-in-a-row by Rodriguez – and took a three-point lead with 3:25 to play following four-straight made foul shots. A big three-pointer by Gators redshirt senior center Jon Horford ended the long Canes run and tied the game, with a second three by Horford moments later keeping UF in the contest. Prominent players: Rodriguez made five threes – including the game winner – and scored 20 total points in the final 6:47 of the contest. He finished with a game-high 24 on 7-of-14 shooting, draining 5-of-8 from long range. For Florida, Horford made two late threes that kept the Gators in the contest following the devastating Canes run. He finished 5-of-9 from the field (3-for-6 beyond the arc, 4-for-4 from the charity stripe) for 17 points, adding seven boards to his stat line. First half focus: Florida opened the contest by making its first three baskets and pulling ahead 9-0, but Miami responded with an 8-2 stretch – including consecutive triples – to get right back in the game. The Gators answered back, however, and slowly built a lead that stood at 12 points when the buzzer sounded. Frazier, who went 4-for-4 (1-of-1 from three) for nine points in the opening 20 minutes, rejected Sheldon McClellan as he attempted to dunk, forcing a jump ball turnover and ending the half. Good until they weren’t: Frazier and Carter were a dynamic duo for Florida early on Monday, starting 13-for-13 from the field and 4-for-4 from long range to post 32 of the Gators’ first 54 points. At one point, Carter scored nine-straight points for Florida in the second half before going to the bench with four fouls. Unfortunately for UF, Carter got in foul trouble and Frazier went ice cold over the remainder of the contest, missing five-straight shots to end the game. Carter finished with a team-high 21 points on 8-of-9 shooting (3-for-4 from downtown), while Frazier posted 13 on 6-of-11 shooting. Perfect plays: With just over five minutes remaining in the first half, freshman PG Chris Chiozza found himself with the ball in the corner and nowhere else to go, so he drove the baseline and completed a reverse layup, dropping the ball in high off the glass. Late in the contest, Horford’s two threes – to tie the contest and then give Florida a one-point lead – were extremely important as his Gators teammates struggled to find the bottom of the net. Standout stats: After making just 2-of-8 treys in the opening half, Miami drained 7-of-10 over the final 20 minutes of the game. The Hurricanes also outscored their hosts 29-11 over the last 6:47 of the contest, erasing a double-digit deficit to pull off the victory. What it means: Florida has met its first adversity of the season and did so with one starter – and arguably its best player in redshirt junior forward Dorian Finney-Smith – sidelined with two fractures in his left, non-shooting hand. The Gators will have plenty of opportunities to rebound and get suspended sophomore F Chris Walker back for their next game, but UF has a long way to go to being deserving of a top-10 ranking. Next up: UF will host Louisiana-Monroe on Friday at 8 p.m., its third-straight home game to open the season before heading to the Bahamas to compete in the 2014 Battle 4 Atlantis tournament. Finney-Smith is expected to miss the ULM game but could return to action in the Bahamas. Ruh roh . . . . . . . . .
Timmy T, Chris, Cboyd, Maurice, Head Official (too bad this is a family website. . I would love to hear the story behind that nickname), Ken (CA) (with the unnecessary and uncharacteristically smarta-s comment about firing Donovan) and the alleged “Fan” . . . WHAT IS UP, MY BROTHAAAAAAS!!! Did you miss me? I didn’t miss you crybabies either. We might have lost tonight but we played much tougher, more solid and sounder basketball against a better, ACC opponent. Kurtz was nice, Horford was nice, Eli Carter was nice and has an edge to him that I love. 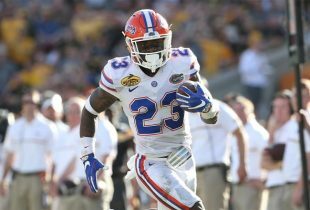 Chiozza is going to give us lots to smile about during his time as a Gator. Hill was good at times but had mental lapses (like the fouls against Rodriguez down the stretch). He needs to get some confidence in his jump shot and then his drive will be deadly. Frazier had some good moments. No Finney-Smith, no Chris Walker (he hurt us tonight by getting himself suspended), and no Alex Murphy. . all things considered, a good performance and nothing to be ashamed of. This team is still learning to play together. We’ll lose a few games along the way but I expect us to be much stronger come February and March. Good learning lesson tonight about mental toughness and staying strong, intense and defensively sound down the stretch. Try not to meltdown, b-tches. I know how fragile you can be. We’re gonna be alright. Maybe you need some time off. Away. From here. Dude, seriously? You have. Your hands. Full. Trying to manage. Your own. Life. And maintaining. Your tenuous grip. On reality. I wouldn’t. Recommend. Taking on. The extra. Responsibility. Of trying to counsel. Others. . . That burden. Can be stressful. On a feeble mind. And is way above. Your. Pay grade. I’m sorry for being a jerk gatorboi. You’re right, I do need to get out more. Maybe I’ll find a girlfriend. I just get so upset when people have a different opinion than mine that I act like a fool. Sorry I’m just a butthurt individual. But I commented first so there’s that. I mean, that’s something that I find really important. Yep. Preferably at. an O.C.D. puntuation. rehab. clinic. L.O.L. Period. Without Dodo they were paper thin inside. Let’s hope he can get healthy again soon & Walker can start living up to his hype (& avoid future suspensions). Rodriquez took Hill to school tonight & if he doesn’t start developing some sort of offensive game he won’t go far. What did he miss?…3 lay-ups? I’m sure this team will get better in time under Billy but it could be ugly for a while. P.S. I submit that already, even as a true freshman, Chiozza is our best defender in the Scottie Wilbekin tradition. Cat quick, tenacious, and a high basketball IQ. He probably should’ve been covering Rodriguez down the stretch . . . but who knows. . dude was unconscious and it was just one of those nights. Like I said before, the No. 7 ranking was out of respect for Donovan. This is not the seventh best team in the country. We do have plenty of talent but they haven’t played together enough to gel as a complete team and are missing pieces. Hopefully as the season goes on they will get a lot better and can make a deep run. The only thing the regular season is going to do for this team is determine their seed come tourney time. disappointed here, but not particularly concerned. Was a thin team tonight that played hard, played strong defense most of the game but basically were only 7 deep. Miami isn’t a great team but is a decent team, full complement of players wouldn’t have gotten gassed there at the end and that 15 point lead would have ended 25+ By conference play they are going to be a strong unit, it is clear they are getting Billy’s message about defense and maybe not the 8th best team in the country right now, but they have the upside to be by the end of the year. No DFS…. no Sky Walker, 2nd game in 4 days with many freshmen/guys that haven’t played much together. Not worried about this loss at all. This team will win the Bahamas tournament next week.